CheckMark Payroll software for Macintosh and Windows is the most complete solution for do-it-yourself payrolls, small businesses and accountants. Work for Checkmark Canada Cloud Payroll Software? Learning about Checkmark Canada Cloud Payroll Software? I am using checkmark cloud payroll from last two weeks. I like the interface and price , its comes under budget. There is no direct deposit fee not even installation fee at the end i am saving lots of money and utilizing maximum . not much...is there i just submitted direct deposit request last week waiting for integration. i can do payroll from anywhere i want. tracking employees payroll is just a breeze. * We monitor all Checkmark Canada Cloud Payroll Software reviews to prevent fraudulent reviews and keep review quality high. We do not post reviews by company employees or direct competitors. Validated reviews require the user to submit a screenshot of the product containing their user ID, in order to verify a user is an actual user of the product. Hi there! 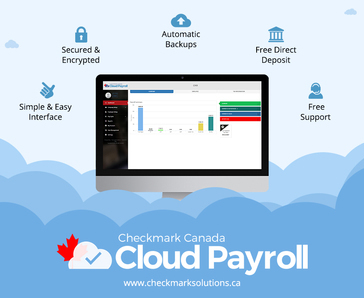 Are you looking to implement a solution like Checkmark Canada Cloud Payroll Software?